BEIJING, May 16, 2018 /PRNewswire/ — German-based automaker Borgward hosted the Borgward Academy of Engineering Ceremony in Beijing on May 9, 2018 at which the automaker the “Borgward Safety Shield” brand value system was showcased. The system was inspired by the corporate mission of being a craftsman true to one’s calling when it came to an immutable focus on rigor, innovation and driver safety since the firm’s inception 100 years ago. As part of the automaker’s roadmap to the new future for mobility, Borgward plans roll out a unique development strategy focused on improved internal combustion engines and electric drive systems, installation of the in-vehicle speed limit under the European Commission’s Intelligent Speed Adaptation (ISA) directive, in tandem with an expansion of its footprint in the EV, interconnection and automated driving sectors. The carmaker has also launched its industry-leading Three-dimensional Sub-meter Satellite Positioning technology, a key step on the road to automated driving. Reflecting improvement in the product mix, Borgward also launched two new models, the 4-wheel drive GT SUV BX6 and its first mass-produced electric model, the SUV BXi7, inaugurating the next chapter in the development of the brand. With the fastback GT contour, which accentuates the overall impression of sporty elegance and powerful dynamics, the Borgward BX6 attracts young drivers with its personalized look and aerodynamic optimization. The eagle wing-shaped LED tail lights resemble the wings of an eagle in flight and complements the vehicle’s eagle eye-shaped headlights. In addition, the new 19″ wheel hub further proves BX6’s position as a pioneer in quality and luxury. 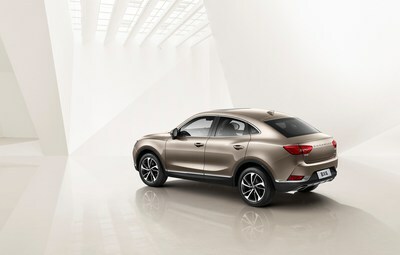 Borgward BX6 delivers high performance. All BX6 configurations are powered by a 2.0T high-power turbo-charged in-cylinder direct-injection engine, delivering up to 165kW and a peak torque of 300 Nm. The engine is mated to a 9-mode 6-speed manual-auto gearbox that provides the driver with a rich and smooth gear shifting experience based on road conditions and driver preferences. Additionally, the fuel-economic 7.1 L/100 km performance with a more powerful drive outshines counterparts in the same vehicle class. All Borgward BX6 configurations come equipped with the 4 MAX intelligent full-time 4WD system that helps the driver navigate slippery roads and medium- to high-speed turns by algorithmically analyzing driving conditions within a 0.12 second-response time and distributing torque smartly. It will be launched in Middle East and South America before the end of 2018, and beginning of 2019 in Southeast Asia. BXi7 is powered by independent dual motors with up to 94.5 percent efficiency output and a peak torque of 390 Nm, leading their counterparts in the same vehicle class. The vehicle accelerates from zero to 100 km/h in 7.9 seconds and reaches a top speed of 195 km/h. With an intelligent thermal management system known for three unique advantages, BXi7 addresses decreased driving range and lengthened charging time caused by extremely high or low temperatures. The battery pack maintains high performance at a temperature range from -30ºC to +55ºC. The vehicle can be charged up to 80 percent within 45 minutes and achieves a range of up to 375km. Borgward now has a strong product lineup consisting of BX5, BX6, BX7, BX7 TS and BXi7. The company is committed to providing consumers with a passionate on-the-road experience, quality of products in line with what today’s car buyers expect from their lifestyle. Meanwhile, Borgward combines the safety space of its proprietary passenger compartment and the extremely rapid response time, which Borgward has dubbed Safety Space and Time.